Telephone didn’t yet exist, roads were tracks in the middle of nature. There were few bush houses, a bank and a post office. When Massimiliano Felici arrived in Sainte Marie in 1993, the island was like that. His first diving center in Madagascar is born on a green pearl in the blue of the Indian Ocean. With his first boat, a piece of hand-painted wood, he began to explore the seafloor, discover wrecked ships, schools of fish off the coasts and the splendid reef surrounding it. But especially it was his first encounter with the humpbacks so he began the “whale watching” in Madagascar with others but very rare operators. By then he is very well-acquainted with whales, their secret and the best manner to observe them. 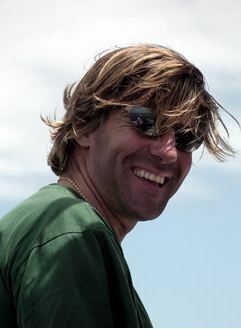 By his very active involvement in scientific missions for the protection and the knowledge of the whales, he becomes member of the MEGAPTERAObservation, knowledge, protection of marine mammals and whale shark association for controlling the coral reef of Sainte Marie Island, as well as of the actual marine park of Masoala peninsula. He shared in realizing various documentaries on Madagascar’s seafloors, on whale watching and on the discovery of two historic wrecked ships: the galleon “Adventure Galley” of William Kidd pirate, and of the frigate “Seraphs”, the most ancient American warship. He now lives in Ankazoberavina and is busy in managing the homonymous park of the island for a conservation project of the sea turtles, in partnership with the WCSThe Wildlife Conservation Society, founded in 1895, has the clear mission to save wildlife and wild places across the globe association and is ready to make you discover all diving sites in the bay of Nosy-Be. Also to make you meet the humpback whales, the shark whale, the minor balenoptère, the dolphins. And to go for a cruise with you in pristine places of the archipelago. So we wish you WELCOME.